Contrary to popular belief, Egyptians were not the first to mummify humans and animals. As it turns out, from a chronological perspective (pending future archeological revelations) the Chinchorro people of the Atacama desert in the what is now modern Chile were actually the first people’s to intentionally mummify their deceased. Mummies have also been created naturally for millennia in a variety of ways, from desiccation in arid climates, to anaerobic bogs, but the Egyptians were the first to both popularize, and stylize their mummification process. Similarly to those (insane) fanatics out there that will collect highly airbrushed Kim Kardashian photos, there are also collectors of ancient antiquities such as mummies. Recognizing how exquisite mummies are, and how they have become highly sought after collectables, UNESCO was inspired to establish rules and laws that a majority of counties have adopted which restrict the sale and purchase of such items of archeological and historical significance. Essentially this has created a black market for ancient relics such as mummies, which is demonstrably worse for the preservation of such items because there is no accounting for their excavation, location, sale, purchase, or authenticity. That UNESCO agreement was established in 1970, which means that for thousands of years prior, any and all of Egypt’s most prized antiquities were plundered, sold around the world, and assimilated into private collections with little paper trail to account for them at all. This makes it possible to find these relics in plain sight from time to time in areas where they would least be expected to turn up, such as the basement of a house in Connecticut where a local restoration company clearing out flood water from a basement uncovered a mummy that had been forgotten about completely. This just goes to show that there are plenty of archeological discoveries out there, and sometimes they can occur in the most strange places, far, far away from where they were expected. 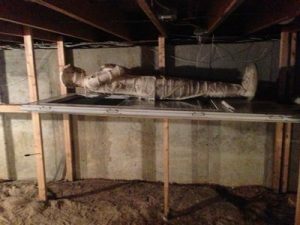 Then again, it is a mummy, maybe it just didn’t like the desert heat in Egypt and decided to haunt this Connecticut house instead. You never know!